Writing a review on a organic and natural Hyaluronic and Kojic Acid Brightening serum like HYKO does not give me only the pleasure of providing you with a high quality serum made with some excellent quality ingredients but also focus on the wonderful changes just a simple purchase of a product can do to support a sustainability project taking place in the heart of the Amazon rainforest. 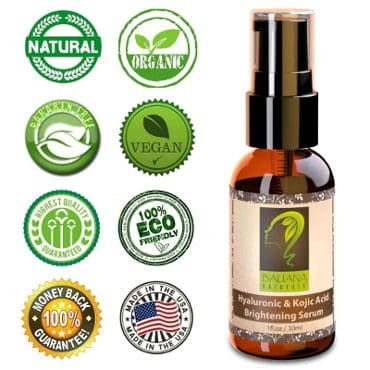 In a few words, Bauana Naturals, the company behind this serum, was launched with the goal of protecting an 82,344 hectare property which is located on the left bank of Rio Buana in the Amazon forest. That’s how the name Bauana Naturals obviously came up and that was the leading force with which a group of people decided to protect the nature and the people living there by also producing top quality products that would use local raw materials. That’s why I was totally thrilled to find out about this project and HYKO, this first product of Bauana Naturals, that as we will see further on contains some great skin care ingredients. HYKO is a natural and organic brightening and anti aging serum. It is based on natural skin brightening ingredients that are clinically proven to be more efficient as well as safer than hydroquinone which is widely used in skin whitening products. According to wikipedia and other online sources, hydroquinone is banned in some countries including the European Union since it is a potential carcinogen. It can also cause skin sensitivity. Instead of using hydroquinone, Bauana Naturals use some natural skin brighteners including Kojic Acid, a completely natural ingredient coming from a fungus. According to WebMD, Kojic Acid is a recent remedy used to treat pigmentation problems as well as age spots. Kojic Acid resists oxidation and this results in a longer shelf life which is particularly useful for people who want to follow a skin lightening treatment for several months. So, while many skin brightening products have a really short shelf life and can’t be used properly for a full treatment, Kojic acis is a lot more stable. Apart from Kojic acid, HYKO contains hyaluronic acid, a humectant which can boost new collagen creation as well as a number of other potent anti aging ingredients such as antioxidants and peptides. Contains a certain type of plant based hyaluronic acid(Cassia Angustifolia Seed Polysaccharide)found in the most prestigious and expensive skin care products. Free of parabens, hydroquinone and alcohol. Contains 28 carefully chosen ingredients for maximum results. Bottle and pump protect from air and light. Reduction of wrinkles, fine lines, dark circles and puffiness. Natural brightening of the skin. Toned, supple looking complexion, feeling smooth and soft. Penetrating for deeper dark spots. Your skin will feel and look 5-10 years younger. Deionized Aqua (Water) – Organic Aloe Vera Extract – Cassia Angustifolia Seed Polysaccharide (Plant Based Hyaluronic Acid) – Witch Hazel – Kosher Vegetabel Glycerin – Methylsulfonylmethane (MSM) – Wildcrafted Ganoderma Lucidum (Kojic Acid) – Glycolic Acid – Hydroxyethyl Cellulose – Carrageenan Gum – Wildcrafted Salix Lucida (Willow Bark/Salicylic Acid) – Organic Glycyrrhiza Glabra (Licorice) – Wildcrafted Melissa Officinalis (Lemon Balm) – Organic Chinese Ginseng – Organic Pimpinella Anisum (Anise) – Organic Horseradish – Organic Schisandra Chinensis (Schisandra) – Organic Fennel – Melissa Essential Oil– Organic Jojoba Oil – Tocopheryl Acetate (Vitamin E) – Sodium Benzoate – Potassium Sorbate – Ethylhexyl Glycerin – Organic Gotu Kola Extract – Organic Horsetail Plant Extract – Organic Geranium Extract – Organic Dandelion Extract. How Do People Review HYKO Serum? Users seem to be very pleased with this product for various reasons which also include a brighter, glowing looking skin. They report obvious results with the fading of their dark spots and they are really glad about it. People of 40+ or 50+ years old mention how more toned, firmer and with less visible wrinkles their complexion looks. Some of them say that they were skeptical of buying this serum in the first place, having used a lot of different products before which faded out shortly after application but HYKO serum was a pleasant surprise for them, feeling that it really works. Having been used on hyper pigmentation from old scars, some good results are also reported. Users love its gel like consistency with the product being easily applied and nicely absorbed without leaving any greasy residues. Finally, people are pleased with the fact that only one or two drops are needed for them to experience the benefits of this serum. After reviewing HYKO Brightening Serum, I would say that this is a worthwhile natural and organic option to fade and even treat your dark spots while also getting an overall, brighter and younger looking complexion. And all that staying away from harmful skin brighteners and ingredients that cause sensitivity and skin damage. Still, since not all products are for everyone and Bauana Naturals firmly support this idea, they offer a 100% full money back guarantee with no bottle returns required. Finally, in my opinion, being able to help a good cause, as I mentioned in the beginning of this article, by making just a single product purchase has a significant value. What Is Hyaluronic Acid For Skin? What Is The Best Hyaluronic Acid Eye Cream?